Good Shepherd Lutheran Church – Bismarck, ND | Tricorne Audio, Inc.
Situation: Good Shepherd Lutheran was looking to improve/expand three areas of their worship ministry. 1) Improve the video projection system in the sanctuary, 2) Improve the quality of their video recordings sent to the home bound and future public access channels, 3) Provide for video/audio distribution of the events in the Sanctuary to other areas of the church. The existing center video screen covered the cross when it was in use and did not provide a vibrant image. Previously the worship service was simply recorded on a camcorder from the AV booth, this did not provide a professional looking video. Lastly, the only location in the church with video overflow was in the fellowship hall. Solution: Working with the staff of Good Shepherd, Tricorne Audio, Inc. was able to design a three tiered system that completed all the goals set forth by the church. The first goal to improve the video projection system was accomplished by installing a pair of permanent screens on each side of the center cross. These screens provided both a minimal aesthetic impact while the projectors are off and a vibrant image when the projectors are on. The second goal included installing a three PTZ (pan, tilt, zoom) camera system with a small controller and video mixer located in the booth. 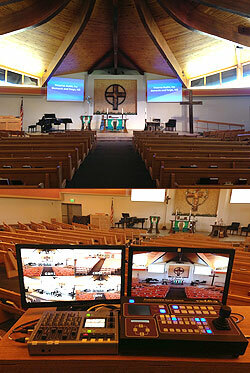 This system allows the church to record broadcast quality recordings with multiple camera angles. Additionally, the small video mixer allows for improved audio quality of the video recordings. The last goal of distributing this improved video to the remaining areas of the church was accomplished with a simple and effective modulation system. Coaxial cable was ran to locations such as the kitchen, nursery, library and gathering space to allow for audio and video overflow to all these locations. This is especially helpful during larger services, weddings and funerals to keep members and guests engaged in worship when they cannot be in the sanctuary.